Dorje Dechen Lingpa (Tib. རྡོ་རྗེ་བདེ་ཆེན་གླིང་པ་, Wyl. 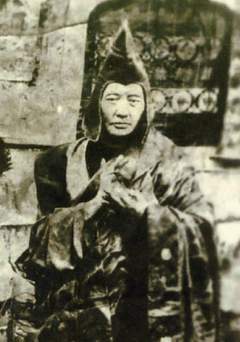 rdo rje bde chen gling pa) (1857-1928) was the reincarnation of Yongdzin Jinpa Gyatso, founder of Domang Monastery, and Lhatsün Namkha Jikmé. He studied with Jamyang Khyentse Wangpo, Jamgön Kongtrul Lodrö Thaye, Palyul Dongak Chökyi Nyima and other masters. He began to reveal termas at the age of twenty-one. In 1927, at the age of 70, he left his monastery and travelled to Central Tibet and eventually Sikkim and India. It was on this journey that he spent five months giving the transmissions for the Rinchen Terdzö at Drikung Yari Monastery. Having returned to Tibet, he passed into parinirvana in Sakya in western Tibet in the earth dragon year of the 16th calendrical cycle (1928). He had two reincarnations, both born in Sikkim. One of them was Yangthang Rinpoche (1929–2016), the other died in 1958. This page was last edited on 29 March 2018, at 22:05.